The club scene is not for everyone. It’s pretty rowdy, pretty sweaty, and pretty vain, though even the most resistant of us still have the urge to shake our butts if the mood catches us right. That’s why when a club scene for people who aren’t necessarily into the club scene pops up, it’s like a perfect storm. A rock front moving in from the east collides with tropical house-electro winds from the west at an amazing two story, multi-room venue, and the result is a tornado of hipsters, scenesters, rockers, and booty shakers all dancing together in a sea of sweat and Red Bull. This Saturday night spectacle was Blow Up Forever at The Factory (formerly Sound Factory) in SOMA. Blow Up Forever is the bigger, badder version of Blow Up hosted at DNA Lounge on the 2nd Friday of each month. Now that you have the tableau of the evening, the main reason for this review is not the event itself, but rather the evening’s only full band to perform. 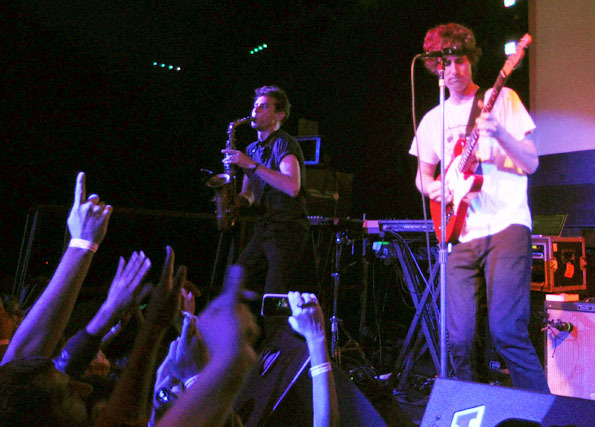 Amongst the laptops, giant headphones, and switchboards was the recently off-hiatus Brooklyn post-punk outfit, The Rapture. 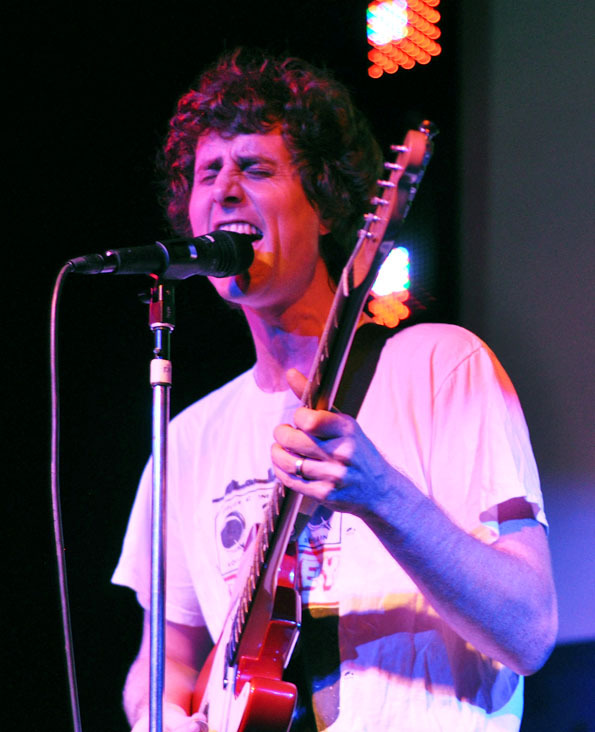 Saturday night’s performance by The Rapture was part of their first tour in more than 5 years. The band took the stage and it was like seeing an old friend after years apart; everything feels so familiar and right. There was no warm-up period, no awkward hellos, they just launched into their set. No one asked questions, only danced and welcomed them with open arms. The fans were ready as they crammed into the large room, trying to get as close to the stage as they could to jump and sing along with all the disco-rock jams the band could throw out. For a band with a new album out, they played a set that navigated their full discography. The first 20 minutes of the set were peppered with songs from Mirror, Echos, Pieces of the People We Love, and their latest album In the Grace of Your Love. It was a great reminder of why we love The Rapture and why we always will. 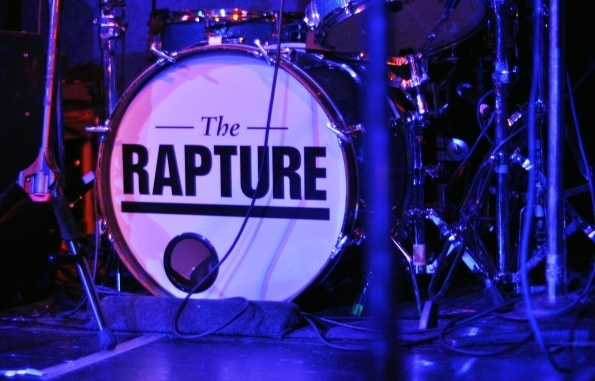 The Rapture have a quiet confidence on stage. 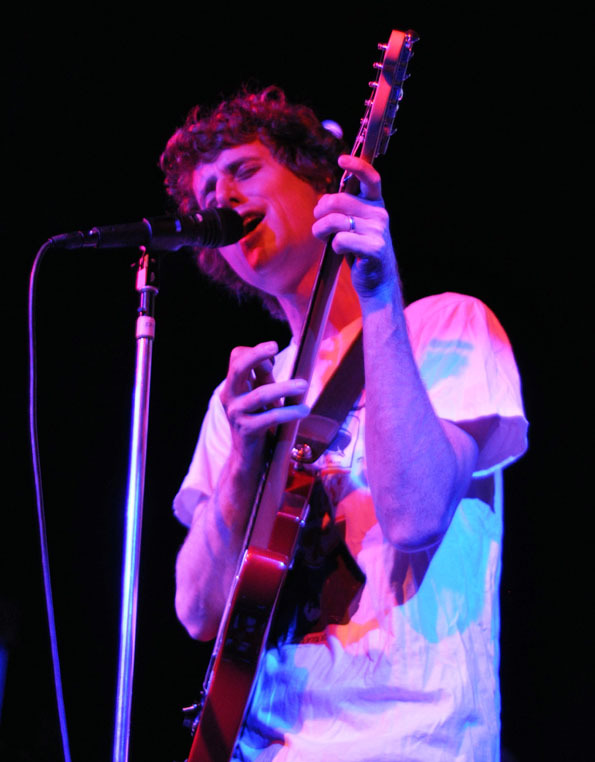 Luke Jenner stands intimately close to the edge of the stage cradling his guitar in his arms while belting out his lyrics. They seem to like leaving the dancing to the crowd, except when Gabriel Andruzzi grinds his saxophone at the front of the stage, which really gets the crowd going. 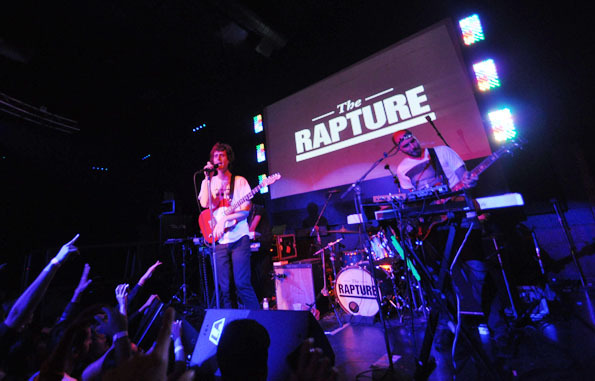 The Rapture fit in perfectly with the evening’s theme. They have a strong electronic sound which is injected into a playful dance-rock style that allows the indie kids, rock nerds, and hipsters to mingle with the tight t-shirts and mini-skirts at the club. Kinda like one big music loving, fashion conscious family. Typically the Rapture is associated with “the end,” but The Rapture has proven that it is only the beginning. The band may have taken some time off, but they have come back refreshed and ready to bring, disco indie rock back to the masses. Blow Up Forever continued into the wee hours of the morning after The Rapture left the stage, but you can bet people were humming “I Need Your Love” as they tried to stay awake on their cab ride home.